The artists and volunteers at StreetFest go out of their way to bring their best to our stage—Sir Winston Churchill Square—for 10 days each July. Amazing talents show off their crazy skills and our volunteers bring their love of our community, our festival and our site with them to each shift. It was July 1998 and the festival was in full swing. Wayne Condo, brilliant silent clown, physical comedian and mime, was performing to a large and receptive crowd. He had just finished his finale when, suddenly, he dropped to the ground. Wayne wasn’t joking around this time. Volunteers, staff and performers came to his assistance and EMS was on site within moments but, sadly, Wayne Condo had suffered a massive heart attack and passed away. In the moments and days that followed, the entire community came together. We took extra care of each other, hugged a little harder and even found ways to laugh again. In the true spirit of StreetFest, many volunteers, staff and festival attendees made a contribution into the final hat for Wayne Condo’s wife Nanni and their two children. A memorial “circle” took place the next day on the spot where Wayne died, and the many performers, staff and volunteers shed tears and released hundreds of balloons into the big blue sky while thinking of Wayne’s spirit and setting it free. I was hoping for a decision on how to direct the funds collected when Wayne passed away: I felt that Nanni and the boys should set the direction. It was then that Nanni mentioned the strongest and sweetest memory she had from the time she and Wayne performed as a duo at StreetFest: the amazing volunteers. We decided that these funds would be used for the Wayne Condo Award, presented annually at our closing banquet to the volunteer who gave their all. As StreetFest celebrates its 30th anniversary, I smile as I think of Wayne, and other artists and friends of the Festival who have come, given their all and gone – Don Snider, Hokum W. Jeebs, Steve Hanson, Robert – Butterfly Man – Nelson and Michael Carl O’ Neil…. 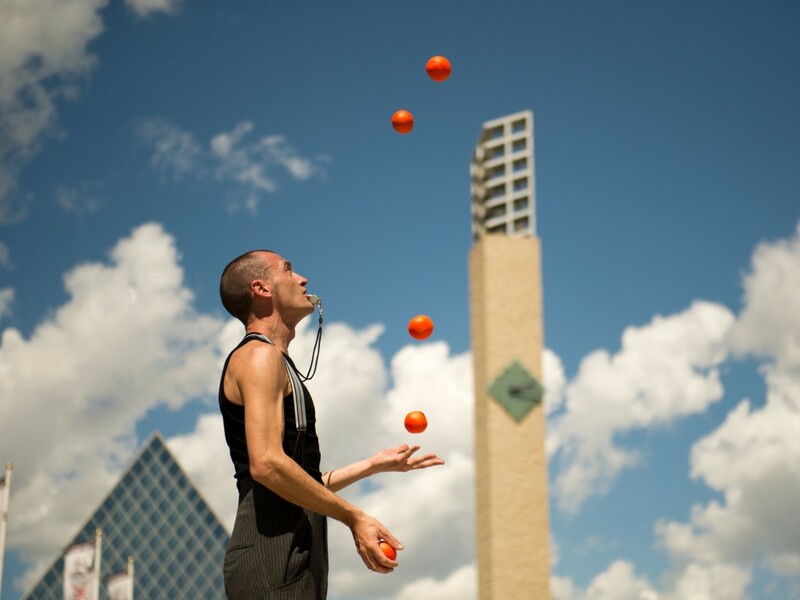 And of the thousands of volunteers who are the heartbeat of the Edmonton International Street Performers Festival.